I've been thinking about this link-up since our Disney Cruise! This is gonna be fun! Today, Shay and I are STRANDED and we're talking about what THREE MEDICINE CABINET ITEMS we'd want to have with us. You guys should join us. Let's be real...if I was stranded on an island I wouldn't care about my hair one bit, but it's hypothetical, right? This shampoo and conditioner is my very favorite. It always leaves my hair feeling super clean, fresh, and smelling divine. When I was younger, my hair would be a grease pit at the end of the day, but now I can go three-four days without washing. I splurge a little since I'm really only washing about twice a week. And this dry shampoo in between a real washing is my favorite. I'm an R + F girl, so of course I'd need my skincare products! The Redefine regimen is my very favorite. It comes with a Daily Cleansing Mask, a Pore Minimizing Toner, a Triple Defense Treatment (daytime moisturizer), and an Overnight Restorative Cream (nighttime moisturizer). 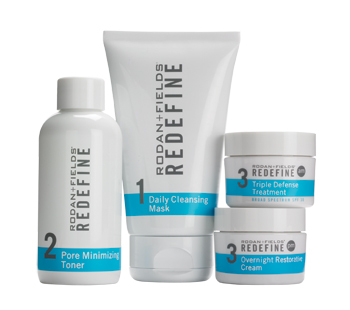 This regimen tackles large pores, fine lines, and wrinkles. I've been using this regimen for almost two years and it has changed my skin. If you're in the market for new skincare, you should give it a try. E-mail at alittlebitofeverything83@yahoo.com to learn how to save 10% off your order and receive free shipping. 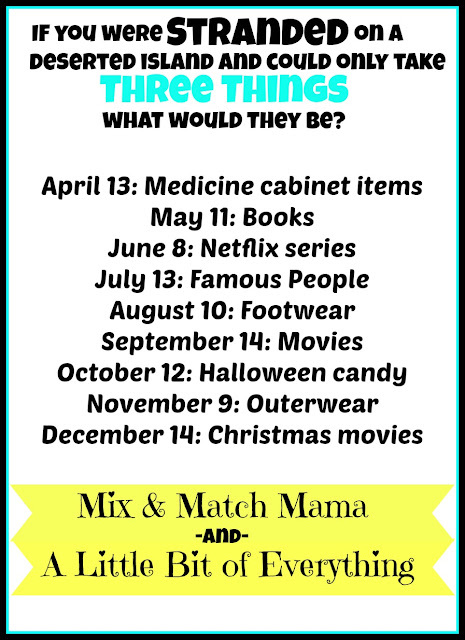 Join us next time, May 11th, and share what three books you'd want if you were STRANDED!! 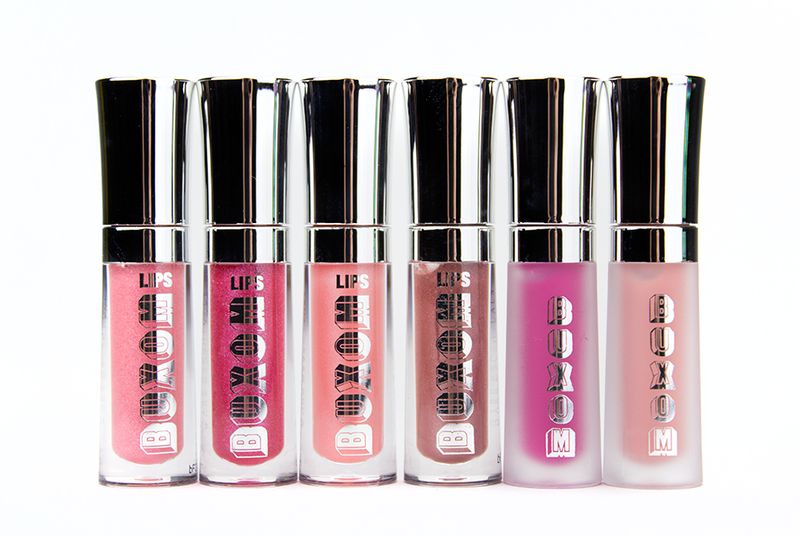 I'm not going to lie...I'm laughing at your gloss! I just read where Megan is taking Tylenol. Why didn't I put down some sort of medicine??? You and I both know that I'll need some sort of anti-nausea medicine. Why didn't I put that? So fun doing this with you! Well, you might die of infection without some sort of ANTIBACTERIAL....but you'll look pretty! Hysterical! I know!!! Clearly, I assumed there'd be someone there to build us a house and whip up dinner. Hahaha! Okay, you and I should never ever get stranded on an island together!! Haha! I mean, we would have SO MUCH FUN, but Lord Help us with our lip gloss and eye masks! Haha! Not practical!! Your eyes would be looking fab and I'd have shining lips though! Haha! I also have "grease pit" hair and looking for a new shampoo and conditioner. Do you color your hair, I think you do, or I'm super jealous...you're coloring is great!! ;) I get highlights so I want something that is also good for color treated hair! What fun items! I have been wondering about that shampoo and conditioner so it was fun to read yours!! Also- hahaha! this was so hard to just pick three! Hopefully someone would share shampoo and conditioner since I didn't list those! yikes! :) Thanks for such a fun link up! I am a newer reader to your blog and am loving following along! I'm in need of a new shampoo and conditioner. So far I've made a grocery list from your and Shays lists! Haha, hilarious - beauty products!! I am going for a toothbrush if I am stranded!!! No worries girl I'll share my Tylenol with you!! But I need to try that shampoo and those glosses!! Such a fun link up!! I am loving all of these items, hilarious! Such a fun link up. I wouldn't be able to live without my lip gloss/chap stick, too! There's nothing worse than dry lips! Aaaahhhh! Fun link up! 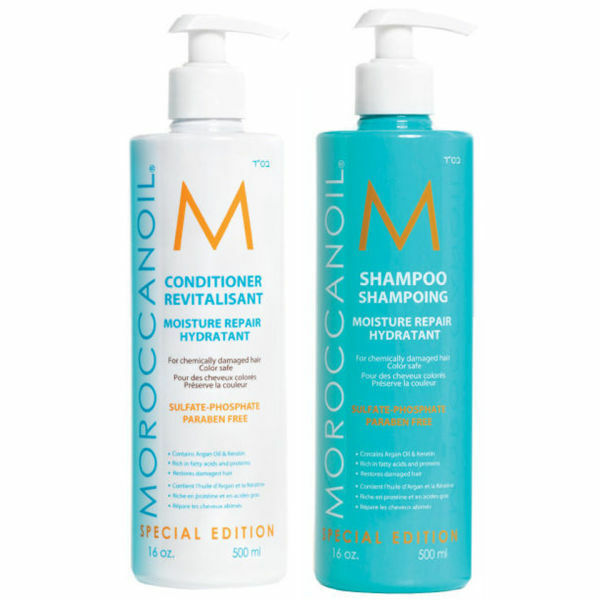 Glad to hear you love the Moroccan oil products, I've thought about giving those a try! After reading several posts, I think we are all better off sharing products! I have zero survivor instincts - I've always said my plan for a zombie apocalypse is to just become a zombie. Ha! I typically wash my hair every other day, and on my off days, I use that same dry shampoo!! I really like the tinted version... it sprays on a little less white! Well I will share my neosporin and benadryl for a little lipgloss and R&F! This was super fun! Can you imagine all us high maintenance girls on a deserted island?!! I'm cracking up on your post seriously! I would definitley be bringing some Advil or some kind of pain reliever with me there!!! Sunscreen too and some pony tail holders. If my hair isn't fixed and it's just air drying on an island, I'm guna need it pulled back or else I would totally be looking like mufasa the whole time and frizzy hair totally stresses me out. Lol. You know I can't leave home without my R+F! I am bringing Reverse to the deserted island! This link up is fun! Shampoo and conditioner! Genius. I can't go a day without washing my hair. I've heard great things about R+F.